On this 5-hour catamaran cruise, experience Santorini’s famous beauty the way it was meant to be seen — from the water! Swim and sun at the island’s vibrant Red Beach, and soak all your cares away in a natural volcanic hot spring. Santorini’s ancient caldera provides an epic backdrop for a fresh Grecian lunch served onboard, complete with unlimited wine and beer to help you on your way to total island bliss. Sleep in if you like, and be ready for midmorning pickup at whatever destination suits your travel itinerary — your hotel, the airport, the cable car station, or Vylchada port. Climb aboard a comfy catamaran and set sail for a scenic cruise around Santorini’s naturally stunning highlights. The first stop is the island’s distinctive Red Beach, where mineral deposits create a vivid palette of rust-colored rock and sand against the cool turquoise of the Aegean. Following a 20-minute swimming break here, continue on toward the Indian Rock landmark, a striking jagged cliff that resembles a face in profile. 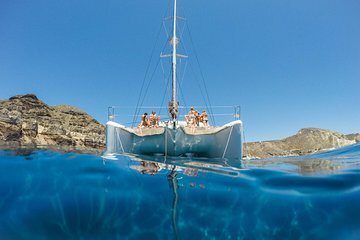 When the catamaran reaches the caldera formed by the ancient eruption of Santorini, drop anchor and disembark for a swim in natural volcanic hot springs. Soak your troubles away in the shadow of the dormant volcano, and then climb back aboard for a freshly prepared lunch. Enjoy a generous spread of seafood, chicken fillet, and salads while also savoring unmatched volcano views. Top it off with unlimited beer, wine, and soft drinks served throughout the day. This tour was awesome. Crew was so delightful and attentive. Cant say enough good things about them. We had a couple of travelers who get sea sick but were absolutely fine on this tour. Smooth sailing except for when the Jet Boat flew by. Take this tour- you get to see Santorini from an angle you cant get on shore. Beautiful! The trip was fun, the food was great and the crew was friendly. What more could you ask. This is the second tour we have taken oith Viator and we have been happy with both.